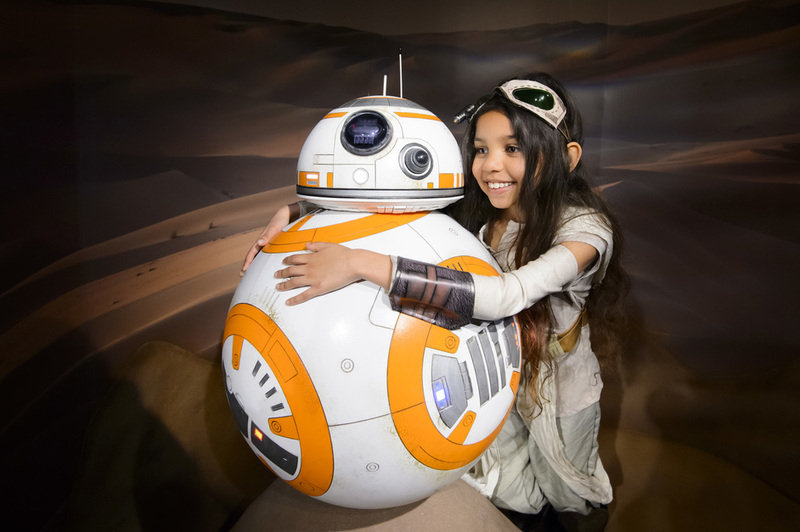 Just in time for Easter, from Friday 25th March 2016, a new character comes to the epic Star Wars at Madame Tussauds display - an exact replica of BB-8. Not only that, anyone turning up dressed as a Star Wars character over Easter Weekend will receive a free BB-8 gift. The two-foor, multi-million pound Star Wars experience at Madame Tussauds (which opened in May 2015) has authentic walk-in sets, special effects and 11 separate sets which faithfully reproduce the film's most memorable scenes. You can imagine you're Luke Skywalker in Star Wars: Episode V The Empire Strikes Back as you step into Yoda's swamp, and feel the fiery lava of Mustafar as Anakin turns to the dark side in Star Wars: Episode III Revenge of the Sith. Fans can come face-to-face with Stormtroopers, witness Luke Skywalker as he battles Darth Vader on the Death Star and join the captive Princess Leia and the evil Jabba the Hutt in his Throne Room. Hang out with Han Solo in the cantina before stepping onto the Millennium Falcon with Wookiee warrior, Chewbacca. May the force be with you. What are the best dining options near Star Wars at Madame Tussauds London? Star Wars at Madame Tussauds gyms, sporting activities, health & beauty and fitness. The best pubs near London Star Wars at Madame Tussauds. Star Wars at Madame Tussauds clubs, bars, cabaret nights, casinos and interesting nightlife. Where to have your meeting, conference, exhibition, private dining or training course near Star Wars at Madame Tussauds. From cheap budget places to stay to luxury 5 star hotels see our special offers for Madame Tussauds hotels, including Montagu Place Hotel London from 65% off.